Are you looking to setup a home gym or designated workout area? Putting down durable mats can prevent damage and also make floor exercises more comfortable. Below we'll take a look at the best options. You have decided that this is the year you are going to get healthier. You have a meal plan all ready to go, and now you’re tackling exercise. The combination of eating healthier and exercising will help you reach your goals in no time. If you’re like many folks and want to save some money while improving your health, you might consider working out at home. Home workouts can be just as effective as heading to your local gym and in the long run, save you money. Even if you don’t have a ton of equipment one of the best things you can purchase for your home gym is flooring. While it might not seem like a huge deal, especially if you already have a place to work out, the proper flooring can make all the difference. This guide will go over some of our top picks for home gym flooring. Why Should I Use Gym Flooring? If you have ever been to a gym, you’ve seen the rubber flooring in the exercise equipment room. While it might seem like this flooring is just standard practice for all gyms, there is a reason most workout facilities use it. Proper gym flooring can help with stabilizing joints, providing traction or grip, offer cushioning for joints, absorb sound, and protect from injury as well as daily wear and tear. Many people worry about the damage exercise, especially high impact exercise such as running, can do to their joints. When done correctly, exercise is one of the best ways to strengthen your joints and prevent future injury (1). Proper form, not doing more than you can handle at your current fitness level, and exercises are all key in protecting and strengthening your joints but so is the right flooring. Most exercise flooring is either rubber or high-density EVA foam, and both materials work to absorb any impact from exercise. Unlike hardwood or concrete floors, these materials prevent the movements you use from reverberating back into your bones and joints, which could ultimately cause joint damage. Gym flooring also keeps you stable and improves your grip when performing an exercise. Stability and grip are crucial especially when weightlifting. Weightlifting is another way you can improve your joint health when appropriately implemented (2). If you are strong enough to lift heavy weights, you need proper form including aligned and stable joints. Gym flooring can keep you grounded and provide extra grip, so that you can lift weights correctly. What Material Should I Pick? Gym floors can use high-tech materials such as floating hardwood flooring or something as simple as cork. When it comes to home gym flooring, you will often find rubber and high-density EVA foam. These are usually the most affordable options for home gyms and provide all the benefits of professional gym flooring. What you choose will come down to your specific needs, budget, and the space you have in your home. Both these options are an excellent choice for your home gym, but you need to consider the exercises you’ll perform most often and your budget before you choose the flooring you want. Rubber has long been the flooring of choice for both commercial and home gyms. It is incredibly durable and can handle every activity from weightlifting to high-intensity interval training (HIIT). It will protect your existing flooring, so you don’t have to worry about scuffing it or dropping weights. Rubber flooring also absorbs sound well, so it will be quieter which could be crucial if you don’t want to disturb the others in your household. Rubber does tend to be more expensive than foam, but it will last a long time, so the cost could be worth it. It is also much denser than foam which might make it harder to install, but it is also what makes it durable. 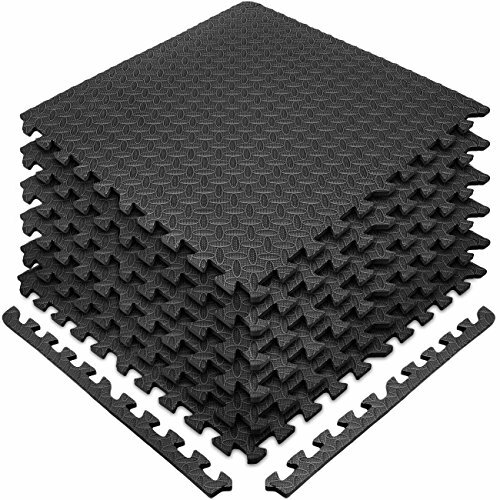 High-density EVA foam, sometimes called foam rubber flooring, usually comes in individual tiles that look like puzzle pieces. You can lock them together and fit them to the size of your space which is a nice option for home gyms which might be smaller. Foam tends to be much lighter than rubber flooring which makes installation easier, but it can also be softer. If you are using your home gym for things such as yoga, Pilates, or another low-impact exercise, this is great. Higher impact workouts might be a little much for some foam flooring. Foam is also less expensive than rubber flooring, and it is easy to wipe down and clean. Because it is softer, if you leave furniture or gym equipment on it for a long time it could leave a lasting impression. It’s also a little weaker than rubber and could tear or puncture with some exercises. Working out at home might seem like it won’t be as effective as getting a gym membership but there are plenty of benefits to a home gym. The most significant advantage is the cost. Depending on the exercises and routines you use, the price of working out at home can be very inexpensive. Workouts like yoga, bodyweight training, or HIIT require almost no equipment to get started. If you do choose to invest in dumbbells, exercise equipment, or flooring, it might cost more upfront, but because you won’t pay a monthly fee like at a gym, you will save money in the long run. Privacy is another benefit of a home gym. Many people, especially those that haven’t worked out before, feel better working out at home rather than in front of other people. Home workouts give you the opportunity to learn what works best for you without feeling like everyone is looking at you. Finally, it’s much easier to workout at home than head to the gym. You don’t have to get in your car or deal with traffic because you can just step into your home gym or roll out your mat in the living room. This can keep your motivation high because you are always at the gym. Plus, there are plenty of workout DVD’s, apps, videos, and more you can access from home to keep you interested in your routine and help you meet your health goals. What Workout Routine Can I Do at Home? You can set your own timer, or follow a video (3). The video offers guidance for each move as well as a built-in timer, so you don’t have to worry about it. Here are the top choices for home gym flooring. We looked at some of the pros and cons for each one, so you can make the best decision for your situation. 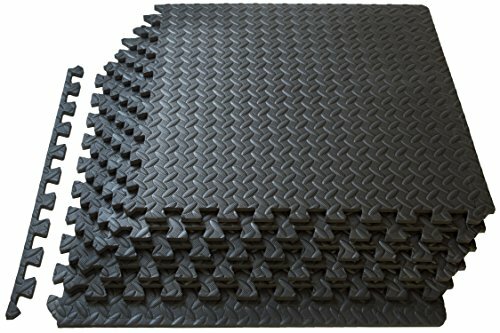 The Square36 Mat is an 8 x 6-foot exercise mat made of durable rubber. It is a portable option for exercising you can roll up and store out of sight when it isn’t in use. It is a versatile you can use for any exercise routine including weightlifting, cardio routines like P90X or Insanity, Zumba, or underneath a punching bag. The top layer of the mat is made of rubber to help with shock absorption, and the bottom is circular foam to help with stability and keep the mat in place while you work out. It also comes with a storage bag and straps, so it’s easy to roll up and store in a closet or under your bed. The Gorilla Mat Exercise Mat provides a workout area of 8 x 4 feet and is a ¼” thick. 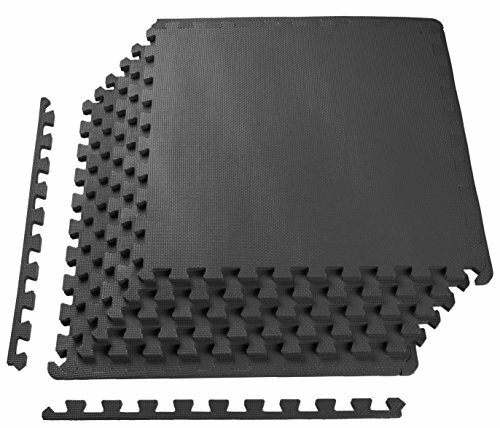 The mat is dual-layered with the top a high-density durable rubber. The bottom has a circular pattern that helps it grip to any surface you put it on. The mat is thicker and isn’t too soft, so you can still do any work out without a problem. The Gorilla Mat also rolls out and lies flat, so you won’t trip over any curled edges. It comes with two straps to keep it rolled up when you aren’t using it and a microfiber towel that wipes away any sweat, so you don’t slip during your workout. The Sivan Health and Fitness Puzzle Exercise Mat is a waterproof mat made from high-density EVA foam. You get enough tiles to cover a 24-square foot area, and they quickly lock together to form one piece. You also get end borders, so you have no jagged edges. The mat is sticky enough to grip to hardwood floors or carpet, so it stays in place no matter what workout you do. It is also mold and mildew resistant, and it is easy to clean. You can also use these tiles underneath workout machines to absorb sound and vibrations. The interlocking Puzzle Exercise Mat from ProSource covers up to 24 square feet, but you can assemble it for smaller spaces too. The texture helps make it non-skid as well as grips to surfaces such as hardwood, concrete, or carpet. The foam is high-density EVA and made without toxic phthalates. The mats are ½” thick and can help protect your floor from workout equipment as well as your joints from higher impact exercises. It’s water resistant and easy to clean. 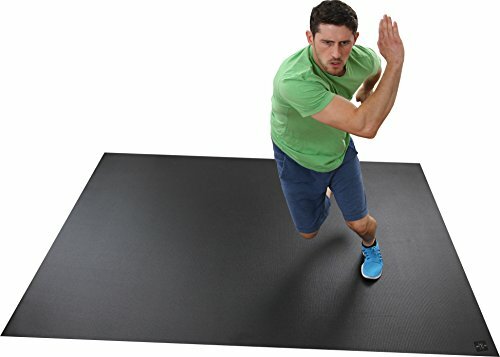 The BalanceFrom Puzzle Exercise Mat is six tiles that interlock to form a 24 square foot workout space. The ½” EVA foam helps protect your floors as well as your joints while you work out. You can use it for bodyweight or cardio routines as well as place it under exercise equipment such as an elliptical. It’s water resistant, and you can easily wipe sweat or other moisture off with a towel. It doesn’t contain any phthalates and comes with border pieces to create clean lines. The tiles are also lightweight and simple to put together and break down if you need to store it. The flooring you use for your workouts can either help you exercise for years to come or possibly lead to injury and damaged floors. The Square36 Extra Large Exercise Mat is one of the most versatile and simple home gym flooring systems you can find on the market. It might be a little pricier than other options, but it provides everything you need for a safe and effective home routine. The rubber top will stand up to any exercise including lifting weights, cardio, and low-impact routines such as yoga. It will protect your joints while you work on your fitness and improve your overall health. It’s also easily stored and portable, so if you want to workout at a friend’s house or even outdoors, you can take your flooring with you.